For years, the tiny island nation of Genosha has enslaved its mutant population while the rest of the world turned a blind eye. Now, as the situation turns bleak, Professor Charles Xavier is stunned to find the true force lurking behind the Genoshan government. 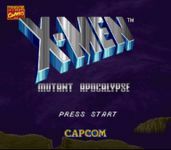 With the fate of all mutant-kind hanging in the balance, Professor Xavaier must unleash the X-Men to face the most powerful mutant of the all- The Mighty Apocalypse! Assemble a strike team of mighty X-Men including Cyclops, Wolverine, Beast, Psylocke and Gambit. Use mutant abilities such as Cyclops' "Optic Blast" or Psylocke's "Psychic Knife" as you battle your way through 16 stages of mutant mayhem.